Let’s get the acronyms and definitions out of the way before starting. More than a few contacts quickly went dark, although not all. Hmm. A hearty “Thank You!” to those who responded and engaged with my request to chat. There is a focus on what is considered to be lower hanging AI need that could more readily be solved thereby generating a more immediate AI-based revenue stream. In other words, this isn’t an area they deem an important business differentiator right now. The NLP market covers a large number of industry verticals, from banking to medical, to fun, just about every aspect of daily activity, which means NLP is a huge market. Natural Language Processing market is estimated to be worth 16.07 Billion USD by 2021, and $22.3 Billion by 2025. There is a lot of R&D going into the NLP space. Understanding the nuances of language is AI’s next great challenge. And make no mistake, understanding the nuances of language is the center of the target for this hypothetical AGI REST API service as well. Does that imply in 5 years Hugging Face expects 7.5 billion people to be interacting with NLP at some point or another across their day? 7.5 billion is a very large total addressable market. Which may explain why there is so much investment chasing NLP. Below is a link to an article listing VC’s and investment angles seeding and growing this domain, appropriately titled “Follow The Money…”. Be sure to check out “Appendix I: CB Insights overview of AI M&A activity” toward the end of this piece — very eye-opening. …(chatbot) presence is only predicted to grow, with Gartner saying that 25% of customer service operations will use chatbots or virtual customer assistants by 2020. Businesses using chatbots report increased customer satisfaction — but isn’t a good customer experience one with a personable, well-trained human involved? Millennial consumers are more comfortable than older generations in contacting their bank or credit union without having a conversation with an actual human. 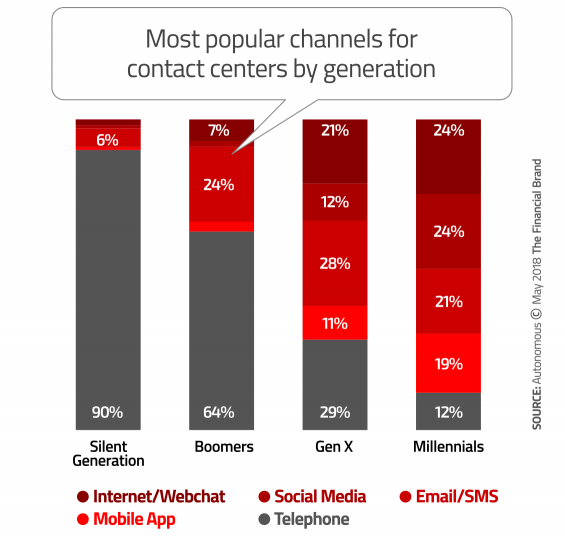 90% of the Silent Generation (born 1925–1945) have a preference towards human service over the phone, while only 12% of Millennials prefer phone, with nearly all others looking for chat, social or text channels. Clearly, NLP is the present and future customer experience for banking. Yet, as aggressive as the banking segment is with NLP, there are very real limits to NLP response capabilities which will impact customer experiences. AI NLP responses are constrained to their training. When customer conversations go beyond the AI NLP training, NLP responses are constrained impacting customer experiences. There are a few references below that address the limits of today’s NLP. To get a good idea as to where NLP is today, check out the NLP Progress website. The “dials” of which can be applied to a multitude of implementations, whether subscription, pay per use, or some other revenue model. Since we are just starting, let’s start with something really basic, trying to keep this initial model as simple as possible. Let’s say the consumer of the API pays per second of request time. Let’s define the consumer of this hypothetical AGI REST API service. The service is intended to provide human insight into conversation data that exceeds NLP training data, therefore consumers for the service are NLP implementors. 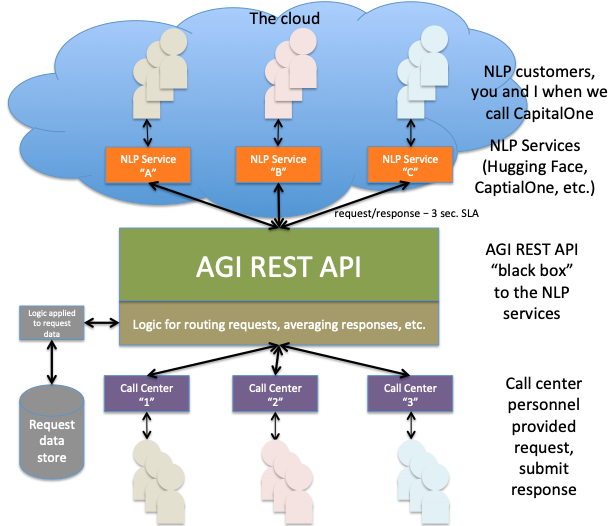 The usage scenario for for the consumer of this hypothetical AGI REST API, as an NLP solution provider, is where the NLP process has reached a point in its workflow that it has determined that the “conversation” has strayed beyond its training and desires additional insight into the conversation in order to respond to their customer with something meaningful in order to provide a great customer experience. In this proposed implementation, the NLP process would post a request to the hypothetical AGI REST API. As a result of consumers who are time constrained for a response, the NLP requestor is waiting so that it can complete its task, let’s, therefore, create a completely arbitrary, but somewhat reasonable service level agreement (SLA) response time of 3 seconds. To keep this model as simple as possible, for now, let’s say that the service charges two pennies per request second. So the max amount an AGI REST API customer could expect to pay, per the SLA, two pennies times three seconds, or six cents per request. Let’s also say that our cost for providing the response is one cent per request second. That yields, in this overly simple model, a margin of one cent per second. This is a good point to reference the service implementation model explanation below, as it illustrates how the hypothetical service would drive down the consumer connection cost. The penny model below is meant only to illustrate a hypothetical revenue model as a baseline for future exploration. As we all know, there are 864,000 seconds in a day. I’ll let you do the math for a year. For now, this simple model of two cents/second usage, one cent/second cost, and one cent/second margin is enough to lay the groundwork for whatever variation on this theme seems appropriate. Let’s say you hold true to the one cent/second margin, and varied the charge and cost dials. At a one cent/second margin, this hypothetical model “feels” like a relatively strong business to be in at the scale of thousands of requests per second. Let’s say this hypothetical entity was able to engage and help just 1 NLP provider in its first year, say an entity like Hugging Face. Hugging Face has over a million messages per day. If Hugging Face used this hypothetical service for only 1/100th of those million messages at the three second SLA, the cost to Hugging Face at two cents per request response second, it would equal 2 cents/second X 3 seconds per the SLA X 10,000 messages (1/100 of the million daily messages) or roughly $600 for that day. That cost would be expected to drop significantly with time. See the section “Implementation Thoughts…” below for how the cost reduction would happen. It might be expected that after the first year, the cost is dropped 1/10 to $60 per 10,000 requests due to the AGI REST API gained efficiencies. That is a great deal to Hugging Face to help them provide improving message responses to their customers supporting their 10x (from a job posting for a Hugging Face software engineer) improvement goal. In fact, this hypothetical entity might enter into a sliding scale agreement, where the cost per request is guaranteed to be reduced over time. The Hugging Face goal is to improve their responses by 10X within a technology with very real “generalization” constraints! Hugging Face is only one entity desiring to improve their NLP return values in a sea of NLP differentiating need. Their goals are very real and very hard as venture capital funded startup so they have a very real incentive to leverage what they can where they can in order to succeed in their goals. Alternatively, consider CapitalOne who recently built their own NLP solution. The point should be made with these two examples that NLP providers will benefit from utilizing an on-demand service when needed within their customer interactions, which is the segway into the point of this financial model. And so on… The “so on…” at the end of year 4 with an earnings multiple is where venture capital makes money. 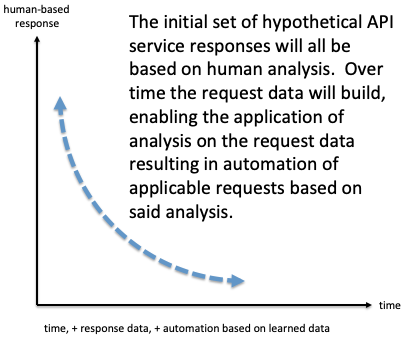 By year 4, after refining its supporting processes and augmenting responses with AI based on the analysis of request data from the prior 3 years which would enable it to reduce its pricing structure and grow its consumer base, this hypothetical AGI REST API service would be expected to be providing thousands of responses per second. The concept is to start “simple” by building an approximation of where we want to get to with a model that works today. Since AGI is the representation of human intuition, the approximation of the AGI is proposed to be the human element the model is eventually meant to model. The idea is to wrap the human element in an API so that to the API consumer the responses look like what they would expect from an AGI implementation. Over time, as the request data builds, it enables analysis and aggregation of request types for future response automation — driving toward a true AGI with time. 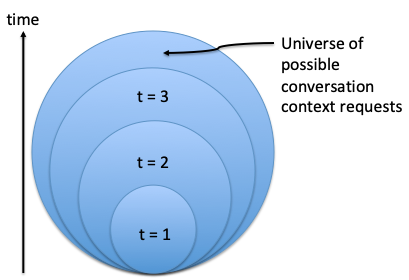 The bubble “t=1” illustrates that the initial set of responses will be a focused subset of conversational context possibilities. With time, the subset will grow to “t=2” and then “t=3”. The above three graphics illustrate that the initial set of API request responses will initially be scoped to a very small subset set of conversation “types” to ensure initial success while providing value to the service consumers. This both ensures initial success and enables data to determine where to grow. Over time, with additional conversational request data, the subset will grow, t=2–3 above, providing greater value to the NLP REST API consumers. Within the AI domain, it has been stated by some of the most respected leaders in the space that a generalization solution, AGI, is at least 10 years out. While the reason’s for the 10-year AGI solution horizon are reasonable given what we know today, that shouldn’t stop an implementation that provides a response that NLP providers would expect from an AGI API. We’re solving the generalization problem chatbots have with conversational context, the information they need when their customer conversations go outside of their AI neural net training so that they can respond appropriately to their customer, resulting in improved customer experiences. Our product is designed for the NLP and chatbot providers of the world, for example, the CapitalOne and Hugging Faces of the world. We make money on each hypothetical CapitalOne or Hugging Face request for context per second to our AGI REST API. Our team is the right right team because we have expertise in providing human-based context insight through an online request response REST API service. AGI may be nowhere close to being a reality, just yet, although possibly sooner than 10 years with the right creative people, implementations, and investments. In the spirit of conversation, I thought I would add a few examples for consideration to help frame this hypothetical service. For participating enterprise customers, the Analytics services provide this data to help the participating enterprises IT customers manage Win10 upgrades across their device and application landscape. The device/application insights are based on ecosystem data. The entire participating ecosystem gains from the insights that result from this shared underlying data. Sift Science provides a conceptually similar ecosystem model to help its customers with fraud risk. Sift Science leverages data from across its ecosystem to provide fraud risk analysis within milliseconds of a customer request. Sift Science provides an additional relevant model. Their AI model is able to utilize a humongous amount of data and then provide a fraud risk value within milliseconds of the request, making the Sift Science infrastructure model worth understanding and learning from. Any proposed AGI REST API will need to approach similar performance metrics. The two examples above illustrate services which would be cost prohibitive for a single business to take on for its own benefit. Rather, by providing the service for the ecosystem, costs are reduced such that the entire ecosystem benefits. A Software as a Service (SaaS) that provided enterprise expense reporting services enabled its customers to simply provide scanned/digitized images of receipts that were then magically converted into data that their corporate reporting systems could consume. The SaaS expense reporting service had found that optical character recognition (OCR) had certain limiting issues. This SaaS service took the scanned receipts and had humans read the image and re-enter the characters into the computer system. The customers using this SaaS enterprise expense reporting service only cared that their process was made easier because they only had to provide scanned images and the service would auto-magically convert those expense report detail images into usable data for their corporate reporting systems. In years 1 & 2, the hypothetical AGI REST API entity might work with only a few NLP partners to refine the initial context response set, and then grow its consumer base as it grows its response set. It seems reasonable that as the underlying data from across the NLP ecosystem gets larger, analysis of the data provided by the requests would enable things like request/response types, and hence automated responses in place of what was human insight. These insights would reduce response costs, which would be passed on to the hypothetical AGI REST API consumers. There is one other interesting element to this model being the underlying human provisioner of insight. This model leverages humans to provide insight into the requests. One could envision this human insight service growing both through the NLP space as well as across the AI space through this “black box” API implementation. As automation replaces certain well-understood requests, the demand set would be expanded, maintaining the need for human insight. Perhaps in 10 years, a true AGI would exist. There might still be a need for human auditing. This is a true human/technology solution blend, not a human replacement solution.